Birds love vegies! Obviously even bird brains know that vegies are good for you! Birds like just about all raw vegies but they definitely have their favourites. All birds love broccoli. The little ones pick off the tips and the big ones chew on the flowers and the stem. Cabbage is another great bird ‘tweat’ and it’s even better on a hot day if you wet whole leaves to put in the cage. Disks of carrots are great. They can be wedged on to the gaps in the cage wire or can be popped into the water bowl of big birds so that they bob for it. Corn on the cob is another delicious one. A whole cob can be hung in an aviary or small pieces can be cut off and put into a cage. Galahs as well as other parrots also like sugar snap peas, beans and snow snaps. Almost all birds will nibble on wedges of crisp apple and pear but don’t give them too much. The only vegetable that you really shouldn’t give to birds is lettuce because it gives them an upset tummy. Give your birds a vegie ‘tweat’ a couple of times a week but remember to take the old vegies out before they get the chance to rot or dry up. 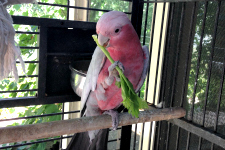 My pink and grey galah, Roger, just loves the ‘tweat’ that I grow for him every few weeks. It’s bird grass that’s grown from his own seed. Birdseed is just a mix of different plant seeds such as sunflower, millet and canola and they will almost all sprout just like normal seed. You can sprout bird seed really easily by sprinkling it onto a layer of cotton wool that you keep wet but Roger is a big boy so I grow him a whole pot of it. To do this yourself, choose a small pot and fill it with regular potting mix. Although I usually say to use premium potting mix, in this case regular potting mix is best as it doesn’t have those little controlled release fertiliser prills in it which the birds might accidentally chew on. The seeds will still grow because they only need a little bit of fertiliser to get to the height for the birds to eat. Anyway, after you’ve filled the pot, give it a light water and sprinkle over some of the birdseed that your bird usually eats. Canary and budgie seed is great for any bird but whatever you have handy will do the trick. Then, sprinkle just a bit more potting mix over the seed making it no thicker than 1cm. Use a watering can to lightly water it again and put it somewhere in the sun to grow. Water it every day. Within a few days the seeds will burst through the top and in a couple of weeks, it will be like a lush green lawn and it will be ready for your feathered friend. The whole pot can be put in the cage for canaries, cockatiels and budgies but big birds might pull it apart so for them just cut some leaves and put it in a bowl of water or in their green feed bowl. Or, do what I do for Roger and get an old wire hanging basket and put it upside down over the top of the pot of grass. That way, he can get to the leaves but he can’t get to the soil or the pot which he would just rip apart.